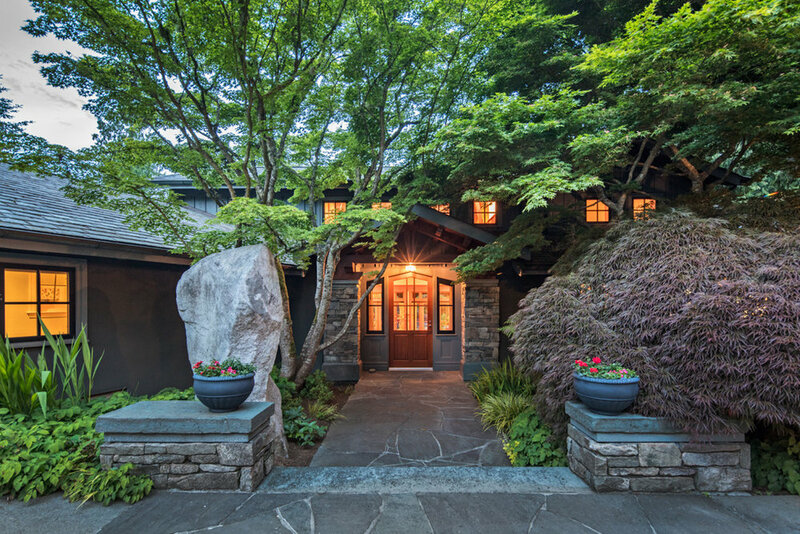 For those seeking tranquility and majesty in a gorgeous natural setting, this expansive and recently constructed Fall City home is a dream come true. Offering 4 bedrooms and 5 baths, graciously spread over 4600 square feet of voluminous living space, this Craftsman-inspired estate presents a grand façade off of a private, tree-lined street with gated grounds and a winding drive that culminates at a dramatically over-scaled post and beam lodge entry. It is at once grand and impressive, yet at ease with its native environs, celebrating lush outlooks from virtually every window! 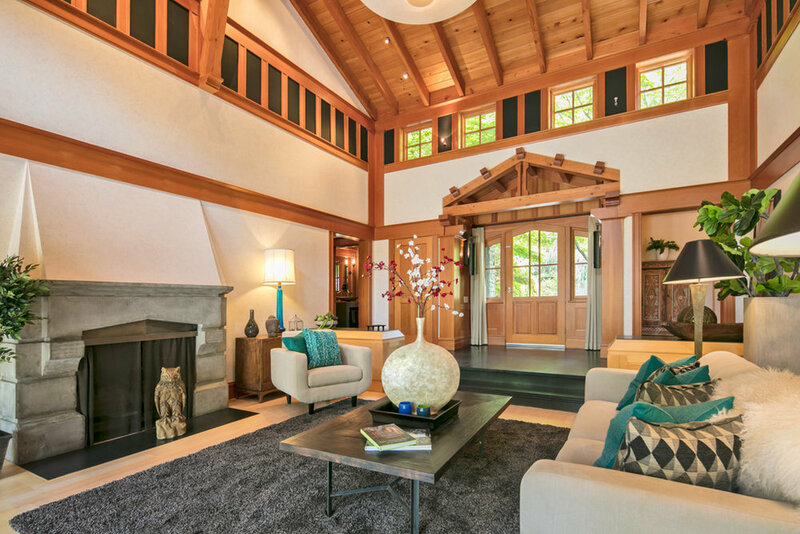 The high, timbered entry opens through extra tall double doors into a grand two-story foyer with vaulted ceilings that draw the eye up to the second floor. To the right of the entry lies a fully autonomous master suite off of a hallway that also includes a powder room and coat closet. A dedicated wine room with wrought iron door is located just beyond the foyer on the way back to the home’s central great room, a two-story, divided space that resides under a sky-lit vaulted ceiling and opens directly out to the landscaped and forested backyard. This room connects to the gourmet kitchen with large dining bar and then completes a circular floor plan in a spacious dining area in the front of the house. A wing to the left of the entry includes an office, additional service bathroom, laundry room and easy access to the huge garage area. A grand central staircase with wrought iron railings winds its way up to a dramatic catwalk on the second floor that leads to three additional bedrooms and a bonus room above the garage. Two of the bedrooms feature ensuite baths and walk-in closets, while the third is directly adjacent to a bath off the hall that is shared with the bonus room. 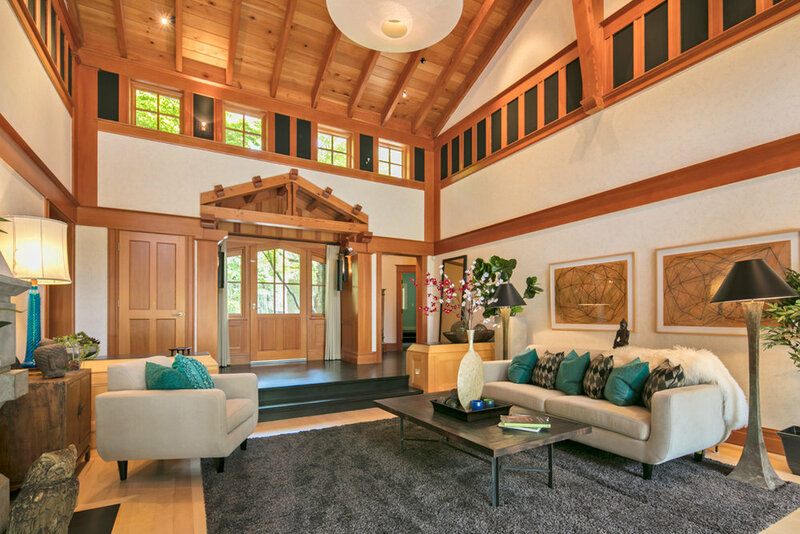 Overall, the sensibility of this home is one of relaxed Northwest style with grand, lodge-like volumes and plenty of natural light through oversized windows and artfully integrated skylights. Elegant details abound, including beamed ceilings, wide-plank walnut floors, intricate moldings and custom cherry built-ins. Ceilings are 10’ high on the main floor, with 8’ doorways throughout that afford a unified sense of grandeur. Recessed lighting provides spot and ambient light for atmosphere and the illumination of art, while designer fixtures focus attention. A pair of eight foot hand-crafted wooden doors opens into the house and allows a site line straight through to the back yard. A great room functions as the primary living space on the main floor, focused on lush views over the forested backyard landscape through dramatic two-story windows on two walls. This area is separated from the casual dining space by a three-sided gas fireplace set into a stacked stone partial wall for visual and physical warmth. Six symmetrical skylights flood this area with natural light. 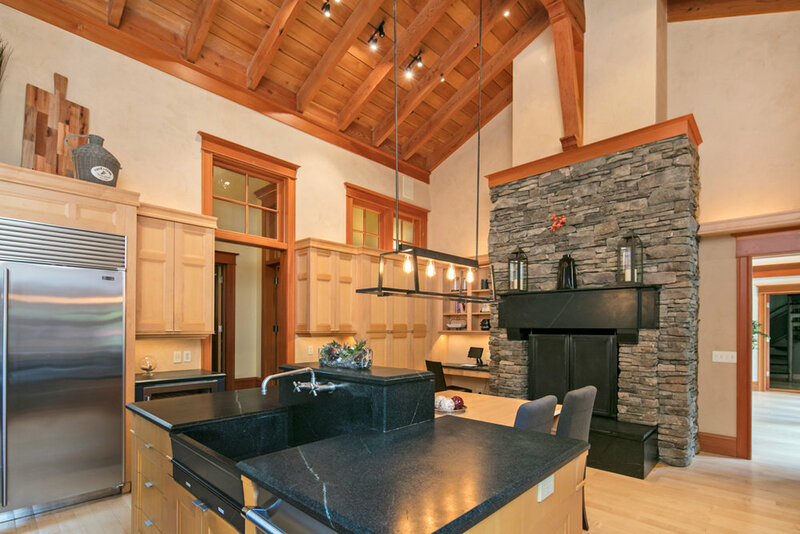 The great room opens out to a huge, timber-framed entertaining porch that overlooks the backyard and offers plenty of covered space for dining, relaxing and cooking with its beautifully integrated stone and wood outdoor kitchen and fireplace with integrated television. 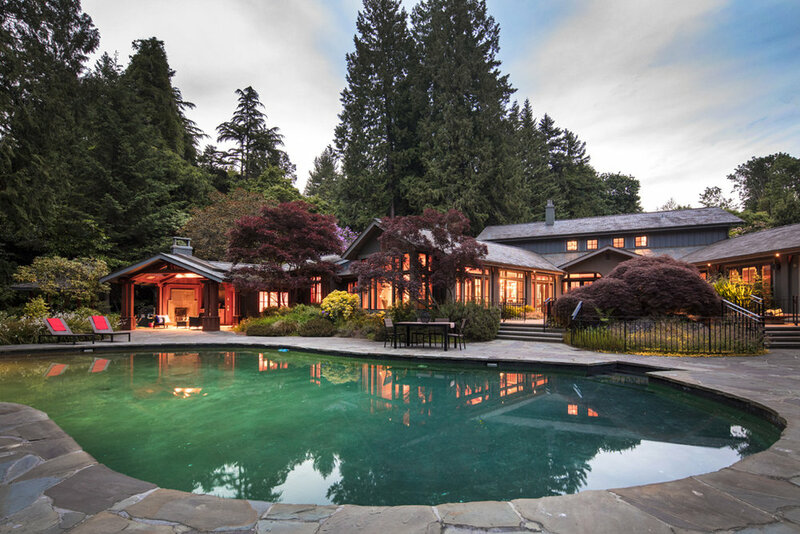 This is a spectacular area for year-round enjoyment, defined by a vaulted and beamed redwood ceiling with skylights and lit by large-scale Arts and Crafts pendant lights. It is accessed through two sets of oversized sliding glass doors off the casual dining area and great room, and includes additional uncovered patio space for enjoying the sun and gazing upon the large, protected and professionally designed koi pond that anchors the backyard landscaping. The kitchen is a fabulous high performance cooking space that is ideally set up for casual entertaining with its large, wrap-around dining bar. Custom hickory cabinets blend gracefully with flame-surfaced black granite counters and slate backsplashes, while the dining bar features an exotic highly figured granite counter. Appliances include matching Electrolux integrated freezer and refrigeration units and double wall ovens, with a six burner Kitchenaid commercial gas cooktop and Fisher/Paykel drawer-style dishwasher. A corner sink overlooks the back yard, and the whole area is served by a large wet bar with its own sink, beverage refrigerator and dishwasher drawer. A walk-in pantry off the casual dining area provides ample storage for food and cooking supplies. The spacious formal dining room sits just off the entry to the house, open to the kitchen for easy serving and staging. It overlooks the front yard through a large set of windows, and is accented by an elegantly beamed ceiling with a bronze chandelier and matching sconces. A large dedicated office sits alongside the dining room and is kept private by a set of double doors that can close it off from the hallway. It includes plenty of space for filing and storage and can easily be used as the hub for home-based business. Down the hall resides an additional powder room that is convenient to the garage, as well as a large and brightly lit laundry room with top-of-the-line Maytag washer and dryer and two walls of custom built-ins with a deep wash sink. All cabinetry and surfaces match the high standard set in the rest of the house. The main floor master suite occupies its own wing of the residence, just off of the central entry hall. It is designed to provide restful outlooks over the forested back yard and large koi pond, and opens onto its own private, covered patio. A gas fireplace provides warmth and atmosphere, while fully integrated surround sound allows for cozy entertainment from the comfort of bed. The huge ensuite bath offers heated large-format stone floors, a walk-in dressing room, matched his and hers vanities with exotic granite counters, a private water closet and a spectacular step-up shower room with multiple heads, a rain shower and textured heavy glass wall with built-in seating. This is opulence at its most comfortable and dramatic. Upstairs, a wall of windows follows the staircase to a dramatic second floor catwalk with an inset glass light well. Two full suites are across from each other off the hallway, each scaled for a king-sized bed and including a walk-in closet and ensuite bath with stone floors and showers and large vanities. A third guest bedroom shares a bath with the bonus area at the end of the hall. This grand entertaining and gaming space includes its own wet bar with beverage refrigeration and is currently set up as a pool, game and rec room with overhead lighting. Of further note is the home’s tremendous garage storage – both attached and detached, and blended seamlessly into the design of the overall property. This is truly a home built for those who collect and enjoy their toys, offering a giant three-car attached garage with double-height ceilings that is deep enough for RVs and large vehicles. The detached garage provides additional vehicle space for storage or projects and includes a full shop area for the most dedicated craftsperson or home mechanic. The house sits on nearly 4.5 acres of carefully manicured level landscaping in Fall City, and is protected by a gated entry and wrought iron fence for privacy. It backs up to and is surrounded by gorgeous native forestland that affords the property tremendous amounts of privacy and seclusion. Neighboring homes cannot be seen, and the community is carefully spaced to preserve a sense of tranquility and openness. Fall City is a historic community that offers close proximity to Issaquah, Lake Sammamish, the Eastside tech corridor and Seattle. It is an ideal location for those with a penchant for outdoor activities, positioned near several of the region’s leading golf courses, within an hour of world-class skiing, and offering hiking, bicycling and water sports activities too numerous to count. Fall City’s uniquely rural setting, dotted with working farms and equestrian facilities, provides peaceful contrast to the cosmopolitan amenities that lie within easy reach, and thus creates a fabulous balance between civility and nature, access and ease.